When is it time to call for air conditioning repair service? When your AC isn’t working effectively or has stopped working altogether, you need an honest, experienced and reliable HVAC repair company to fix the problem as soon as possible. The emergency services our team is on duty 24/7, and our experienced, factory-trained technicians can repair all AC makes and models. We offer free on-site consultations and free written estimates on all air conditioner replacements. 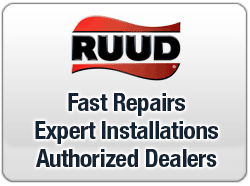 As a Factory-Authorized Rheem/Rudd dealer, we can help you get the most efficient air conditioner at the lowest possible price. Our factory-trained technicians can install your new air conditioner with minimal disruption, and we’ll show you how to use and maintain your new cooling system to best advantage.